By August her condition had deteriorated so badly that Elvis was given compassionate leave to begin a 24 hours hour vigil with his father. 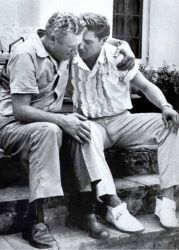 On the night of August 14, Vernon sent Elvis home for same much needed rest. At 3am the phone rang and Elvis was told that his precious mother had died of a heart attack brought on by the hepatitis. In shock and disbelief Elvis rushed to the hospital. After Elvis entered his mother ward and the door closed, witnesses remember a piercing wild despair of wails from Elvis were heard as he wept and prayed long and loud over his mothers lifeless body. Elvis didn’t want an autopsy instead had her lie in state at Graceland. For two days Elvis just sat next to the coffin and just stared at his mother. Finally on the second night Vernon insisted that Gladys be buried. Elvis walked out to the front steps of Graceland and wept. The service at the Memphis Funeral Home was officiated by Reverend James Hamill and the Blackwood Brothers (Gladys, favourite Gospel group) sang: Rock of Ages, In the Garden, I am Redeemed and Precious Memories. Upon Gladys Presley’s Death: Celebrities such as, Marlon Brando, Dean Martin, Ricky Nelson and Sammy Davis Jr. sent their condolences. 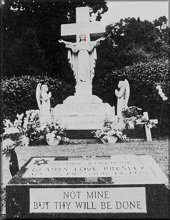 Due to the bizarre August 29, 1977 ” break in” to steal Elvis’s body – on the evening of October 2, 1977, Elvis and his mother’s bodies were moved from their original places of burial at Forest Hill Cemetery and reburied side by side in the grounds of Graceland in an area Elvis had named the Meditation Garden. After Elvis’ father, Vernon Elvis Presley died on June 26, 1979 he was laid to rest next to his son. Why did Graceland erase all signs of Elvis’ Jewish Heritage?